When Richard Titmuss was being treated for cancer at the Westminster Hospital in around 1973, he recalled that he took with him John Rawls’ recent book A Theory of Justice. The serious reading matter is no surprise. Titmuss was a Professor of Social Policy and arguably the key intellectual theorist of Britain’s welfare state and NHS. In practice, he found that he had no time to read the book. Instead, he was far more preoccupied helping in serving tea to his fellow patients, and thereby getting to know about them as people. Tea broke down social boundaries. It symbolised a culture of social solidarity, which for Titmuss lay at the heart of the NHS. Tea drinking, in other words, turned out to be a more immediate vehicle for justice than reading philosophy. Titmuss is well known for the way he used the example of voluntary blood donation in his 1970 book The Gift Relationship as a symbol for the advantages of a free over a privatised health system. The culture of the NHS fostered a sense of social responsibility among its citizens, who came forward to donate blood as an act of generosity. In the private medical culture of the United States people had to be paid, and this proved less efficient and increased the dangers of blood being contaminated by disease. The story of his own treatment for cancer indicates that tea may have functioned as a similarly symbolic fluid. Perhaps tea appears so regularly in stories about the NHS just because it’s one of those things that’s always there. Perhaps tea would appear if we looked closely enough at the everyday life of any institutional space. It’s famously a national past-time after all. There’s something to this of course. Nevertheless, the story of tea within the NHS may be able to provide us with the kind of window on meaning that Titmuss was interested in. This encyclopaedia entry does its best to open up such a history, but to take this further we need to uncover the largely hidden world of practice, and this relies on your memories and experiences which we hope you will contribute in response below. Britain had become a nation of tea drinkers long before the advent of the NHS in 1948, and it was a culture of consumption that extended across age, class, gender and region. In the nineteenth century there had been plenty of medical debate about whether tea might be harmful, but such concerns had been largely set aside as tea emerged as a regular component of the hospital diet. Perhaps with an eye to those who had suggested that excessive tea-drinking might be unhealthy, a guide to hospital food in the new NHS typically included ‘weak tea’, served as part of breakfast and then again in the afternoon. In the calculations of the dieticians, tea was a vehicle for the nutrition of milk, and it would also serve a role in relation to concerns about hydration. Delivery to beds depended on the tea trolleys, which emerged as one of the most ubiquitous features of NHS hospital life. A good ward service, as early as 1949, would involve silent trolleys. And good ‘hospital manners’ meant tea being served in proper cups with saucers and spoons. Clearly, the reality was often some way from these ideals. For this reason, and because tea-tastes and expectations were individualised and deeply entrenched, tea could become a focus for what we might call the micro-politics of care. An area of particular tension was the serving of tea very early in the morning. In the late 1950s, a former almoner recalled that she had gone through her career reassuring people that one of the great advantages of going into hospital was that they’d get a good rest. But now that she was the one going into hospital she was alarmed to discover that she was regularly woken at 5.55 a.m. with the first cup of tea of the day. Here, individual desires and comfort clashed with the regimental running of the hospital ward. By the early 1960s, complaints from patients had precipitated an appeal from the Ministry of Health to end the tradition of waking patients with the pre 6 a.m. ‘ceremonial’ cup of tea. But several hospitals maintained that they had to go back on this when patients said that they actually preferred the early morning tea to extra sleep. Perhaps the most striking example of the feeling that tea was the key to patient satisfaction was the decision of Chesterfield Hospital Management Committee to appoint a tea taster to visit hospitals twice a year. Tea was no less important when it came to the staff. Looking to keep down costs in the 1950s, the Ministry of Health told hospitals that non-residential staff would have to pay for their tea. Visiting consultants were particularly outraged and offended. The debate rumbled on into the 1960s as individual hospitals turned to this as a cost-cutting strategy and deployed the argument that tax-payers shouldn’t have to foot the bill for anyone who wasn’t directly an NHS employee. But the idea of tea-drinking as a basic right, and as a good manners in return for service, was deeply ingrained. An interesting aspect of Titmuss’s story from the 1970s was that it was the patients who were involved in the act of serving tea. This was a practice that was probably largely confined to longer-stay settings, but of course hospital stays were considerably longer in the early days of the NHS so it may have been more commonplace than we’d imagine. It appears, for instance, in the depiction of a ward of male convalescent patients in Dennis Potter’s television play Emergency Ward 9, broadcast on the BBC in 1966. Here, the central character Flanders is the aptly-named symbol for a white, working-class Britain which had fought two world wars for a National Health Service, but now found itself feeling increasingly cut adrift by social change, lying in bed alongside black patients and treated by Asian doctors. The very British symbol of tea was depicted by Potter as something to hold onto in such a context. Flanders exercises and stretches his rights as a patient by demanding tea at all hours. He also distributes this tea to his fellow patients. Tea symbolises his receipt of care and his expectation of this care as a right, but it also symbolises that his place in this system goes beyond one of mere passivity to one of belonging and potential active contribution. However, the limits to social solidarity are obvious when it comes to Flanders’ aggressive racism. Again, tea provides the crucial symbol of the fractures in the national of the National Health Service as Flanders has an over-sugared cup thrown back at him by his Black ward-mate Adzola, who is unwilling to accept further taunts. In the popular television series Emergency Ward 10, aired on ITV from 1957 to 1967 – the program that Potter was referencing in his own title – the hospital tea bar was a central space for plotlines involving the relationships between doctors and nurses. Aneurin Bevan’s vision for the NHS had assumed that it would escape the paternalism of charity: it was ‘repugnant to a civilised community for hospitals to have to rely upon private charity’. Of course, the NHS would escape the embrace of charity in the sense that entry to hospital was now a right. But charities in fact continued to play a role in post-war hospital culture. Volunteers were crucial, for instance, in the provision of hospital tea. They ran the cafes, and they also manned the tea trolleys that brought a more regular flow of tea and human contact into hospital wards. In recent years this culture has been on the retreat. Services provided by organisations such as the WRVS or the League of Friends have gradually been set alongside or replaced by the opening of commercial franchises such as Costa. Critics of this development have lamented less the loss of tea than the loss of the non-commercial sympathy that had accompanied it. Generational change and a shift in tastes may also have played a role in the retreat of the culture of tea and sympathy. Tea was less central for a younger generation who had become so attached to their bottles of mineral water and coffee shops. The drive for efficiency and cost saving was also a factor. In 2004 Newcastle Hospitals Foundation Trust decided that porters, domestic staff and sterile service employees would not be paid for tea breaks. And in 2014, hospitals in Leicester banned their staff from drinking tea while on duty because it would look like they weren’t working hard enough. In such circumstances, the disappearance of tea and tea breaks symbolised a decline in working conditions, but also a decline in a bond between staff and between staff and patients. Tea drinking and tea breaks became less regular, less communal, and less central to the emotional and social dynamics of hospital life. For a shocking representation of that change one might turn to the first episode of the BBC’s series Cardiac Arrest in 1994. Going even further than Potter in subverting the conventions of hospital drama, doctors now escaped to the privacy of linen cupboards to soak their sorrows in the loneliness of spirits rather than the social communion of tea and company. And when it comes to the patients, tea serves, not as a symbol of sympathy, but to signify the descent into a new state of despair within a crumbling NHS as Doctor Rajah pours a cup of tea into the drip of a patient in the absence of readily-to-hand saline. Mass-produced NHS tea cups and saucers were still being produced in the 1980s. Most of this came from potteries in Stoke on Trent. There wasn’t a single design, and there wasn’t a standard NHS tea cup. As in so many areas, the NHS was in this respect less monolithic than one might expect of the largest nationalised industry of its era. 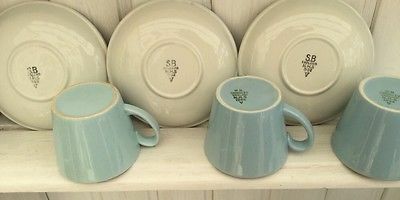 These cups and saucers, stamped NHS on their underside, are now available as ‘vintage’ NHS on websites such as ebay. The fact that the production of these cups appears to end in the 1980s seems significant. It is tempting to suggest that we can begin to locate the decline of a certain sort of NHS culture of tea from the 1990s onward. There is of course still a strong association between the NHS and tea and sympathy. The question is whether this is as much about the way we now imagine and idealise the NHS, as it is about everyday practice and experience. In this sense, it is fitting that if we were looking for the modern-day symbolic NHS crockery we’d find it, not in the mass-produced, matching hospital cups and saucers, but in the ‘Born in the NHS’ mugs that we drink from in our own homes and offices in acts of NHS sympathy. This piece crystallises so many of the value of relationships that have built the NHS – cuppa by cuppa and are the foundation of what it is today.